Green Writers Press, 9780998701226, 240pp. A Caregiving.com choice for Best Caregiving Book of 2017, this poignant and timely memoir was also named American Book Fest’s 2017 Best Book Award Winner for Autobiography/Memoir. Even with her professional background as former hospice consultant who studied aging, illness, and the intricacies of the healthcare system, Melanie Merriman found the real-life experience of caring for her mother humbling. 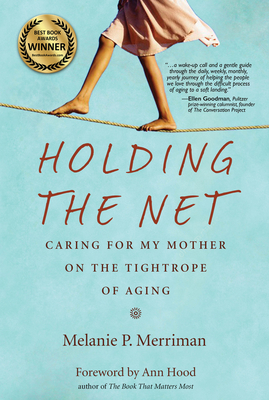 Written for people who have cared for a parent, are currently facing that challenge, or are aging parents themselves, Holding the Net offers practical details about the effects of aging on the body and mind, living arrangements for older people, health care decisions, and surviving a stay in a rehab facility. This story challenges the notion that anyone can be an expert when it comes to caring for an aging parent, and encourages readers simply to do their best. Written for people who have cared for a parent, are currently facing that challenge, or are aging parents themselves, Holding the Net offers practical details about the effects of aging on the body and mind, living arrangements for older people, health care decisions, and surviving rehab. It also challenges the notion that anyone can be an expert when it comes to caring for an aging parent, and encourages us to simply do our best. Melanie hits all the right notes, and her story will have readers nodding their heads and shedding healing tears. Melanie P. Merriman, PhD has spent much of her life as a research scientist, hospice consultant, and foundation grant evaluator—driven by a passion to illuminate, understand, and find meaning. Now she writes with the same purpose. Holding the Net is her debut as a solo author. She is also the co-author of Merriman’s Hawai‘i: The Chef, the Farmers, the Food, the Islands, a cookbook with stories about chef Peter Merriman. Melanie and her husband Klein Merriman split their time between South Florida and Cape Cod, MA.